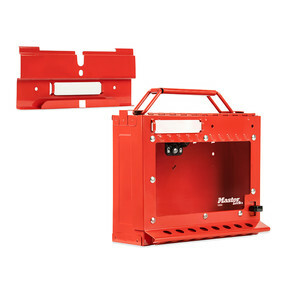 S3650 includes one group lock box and one wall-mounting bracket; safety padlocks sold separately. Rewritable tags on both the lock box and bracket provide areas to communicate job-related information. Laser engraved aluminum tag is optional. 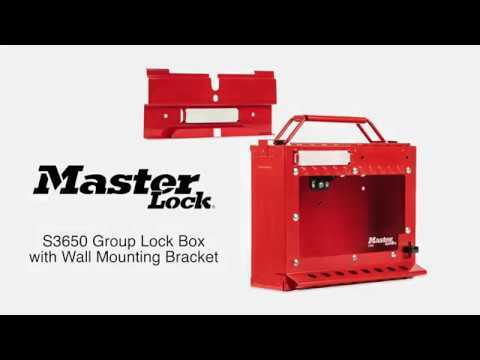 The Master Lock S3650 Group Lock Box with Wall Mounting Bracket helps facilities manage the placement and movement of group lock boxes to protect people. The S3650 can be used wherever it's needed – mount the box using the bracket for routine, daily use; take it portable for remote lockouts; or move to a bracket in another area for large turnarounds. Secure the box to the bracket with the optional locking feature and prevent unwanted box removal from the wall. 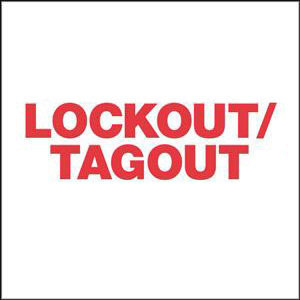 Easily monitor the status of group lockout at a glance with product features like the rewritable tags and clear, impact-resistant window. 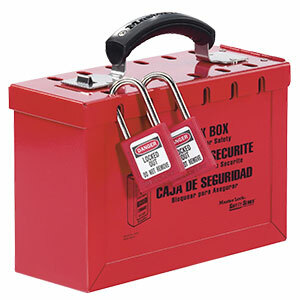 Despite its small size, this box has an internal capacity of 15 safety padlocks, allowing for greater protected padlock storage.